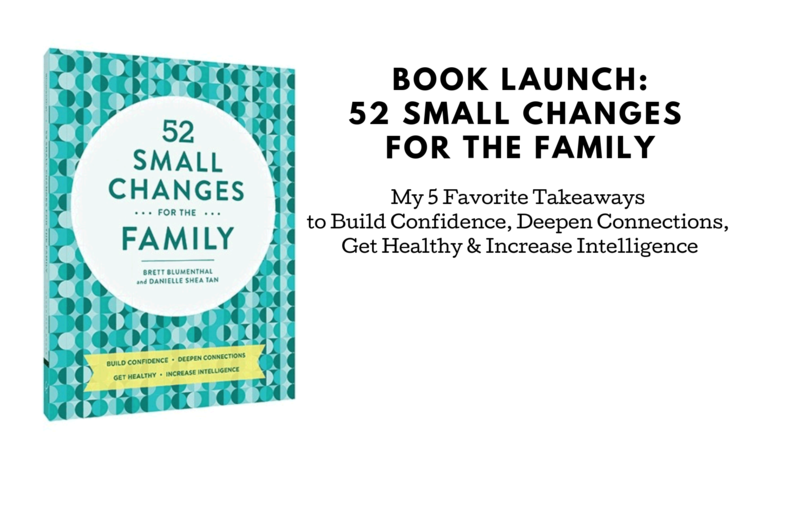 I’m thrilled today to announce the launch of my new book, 52 Small Changes for the Family (available NOW on Amazon!). This is my first book, and I teamed up with bestselling author Brett Blumenthal to add my family health expertise to her winning concept of making a small change each week to create a better overall life for your family. The idea is simple: make one small change a week for 52 weeks and at the end of the year, you and your children will enjoy a happier, healthier lifestyle. Each chapter can be read in just a few minutes before starting the week, and features a “Path to Change,” tips and recommendations to help you successfully implement the change. It’s practical, actionable advice and it doesn’t take a lot of time, but your family will see major benefit as a result. I’ve been sharing take-offs of many of these ideas on my blog over the past few months. In honor of the launch of the book, I wanted to share my five very favorite tips. Without further ado, here they are! I’ve included the chapter of the book so you can read more when you’ve got your copy in your hands. Get it here! This chapter focuses on practicing gratitude. Gratitude is about more than being thankful; it entails us to focus on the joyful aspects of life and the habit of applying positivity to overcome negative experiences. Simply getting into the habit of saying thanks and recognizing the good in life can go a long way towards a gratitude practice and helping your family spread their positivity to people around them and your community at large. Make saying thanks, or verbalizing your gratitude, a priority within your life. Express thanks for the little things your family does and the big projects they take on, making them feel supported, acknowledged and loved. Teach your children that, although we don’t mean to, it’s common to take our loved ones for granted. Combat this by getting into the habit of expressing your thanks as part of a routine, like over breakfast or dinner. Spending time in nature is one of the best ways to boost your family’s health and happiness. As a society, our time with nature is diminishing, studies show, and this disconnection is resulting in a decline in health. Spending time in nature allows families to slow down and connect with one another. This chapter includes actionable tips for family-friendly ways to get back into nature, from a simple stroll in a leafy neighborhood to growing a garden to exploring the idea of a nature-based camp or school for your children. Who among us hasn’t lamented the excess of stuff in our homes? The popularity of Marie Kondo confirms it: the never-ending cycle of consumerism isn’t really bringing us happiness. Psychologists and researchers have shown that we experience more enjoyment by spending money on an experience as opposed to a material possession. As time passes, our enthusiasm for possession wanes, but our emotional connection to our experiences grows. Simple changes your family can make to focus on experiences over possessions include a focus on swapping and borrowing over buying, becoming more mindful of purchases and commemorating your experiences with things like photo books or a family journal. Instead of celebrating with tangible gifts, consider switching over to experiences like parties or special trips. Studies have shown that living mindfully, and focusing on the moment instead of constantly letting your mind wander elsewhere, has a number of mental and physical health benefits for kids and adults alike. A key component of being mindful is being deliberate about the choices we make in life, instead of living on autopilot. It’s easier said than done, and this chapter’s Path to Change walks you through simple steps you can take to live more mindfully. Start by taking stock of how your family spends their time so you can identify opportunities for more purposeful living. Then incorporate mindfulness exercises, set goals and help consider making a “mind jar” to help your children regulate their emotions. All the details are in Week 44 of the book. Research has found that people with multicultural experiences are more innovative and creative problem solvers, better at conflict management, can adapt in unfamiliar situations and achieve great career success. From learning a second language to undergoing cross-cultural experiences, going global can help with flexibility, problem solving, academic achievement, creativity and more. If it sounds difficult to expose your family to multicultural experiences, it’s not. It doesn’t require annual intercontinental trips or expensive language lessons. Instead, we suggest starting simply. Embrace your own heritage at home and visit local cultural sites. Use an online language learning program or hire a family tutor to learn a new language. Be open to cultural events like food and music festivals. Learn to cook international cuisine at home, and even simply talk about current events to help broaden your children’s understanding of the world. There are so many ideas, from the simple to the grand, included in this chapter so you can make global experiences a lifelong journey for your family. If you’ve been enjoying the content on the blog or are looking for ways to make small changes with big impact on your family’s life, I hope you’ll take a moment to check out 52 Small Changes for the Family , available now on Amazon!